The Philosophy Chamber — Feather Work Scientific instruments, natural history specimens, oil paintings, and Native American artifacts come together for our new special exhibition, The Philosophy Chamber: Art and Science in Harvard’s Teaching Cabinet, 1766–1820, opening May 19. Prepared by Charles Willson Peale, Long Eared Owl (Asio otus) (detail), 1786–1827. Museum of Comparative Zoology, Ornithology Department, Harvard University, 67850. Photo: Jeremiah Trimble; Courtesy of the Ornithology Department, Museum of Comparative Zoology, Harvard University; © President and Fellows of Harvard College. Lump of hardened lava containing a tarnished bronze or copper coin. A man in left profile is faintly visible on the obverse. Obverse: Victory, draped, standing r. on prow, holding wreath in r. hand and palm in l. hand. Reverse. : Octavian standing in ornamented slow quadriga r., holding branch in r. hand, reins in l. hand. In exergue. Lavender background shows through in areas of thinnest relief. Zodiac border. Obverse: Laureate head of Nero l.; around. Reverse: Triumphal arch, hung with wreath across front and l. side; above, the emperor in facing quadriga escorted on r. by Victory holding wreath and palm and on l. by Pax holding caduceus and cornucopiae; just below the quadriga on extreme l. and r., two small figures of soldiers; on l. side of arch in niche, figure of Mars standing facing, r. hand holding spear, l. round shield; ornamental reliefs on the faces and plinths of the arch. Obverse: Laureate bust of Vespasian r. Reverse View of the Colosseum showing the front from the outside and the back from the inside, tiers and arches, all containing figures; to left obelisk on base (meta sudans); to right part of a portico. Obv. : Laureate head of Augustus to r.; border of dots. Rev. : Augustus togate seated in stool to l. reaching his r. hand toward small child held by male figure standing to l., naked except for cloak over shoulders. The exhibition features more than 100 works displayed in four thematic sections, including a loose reconstruction of the Philosophy Chamber itself. 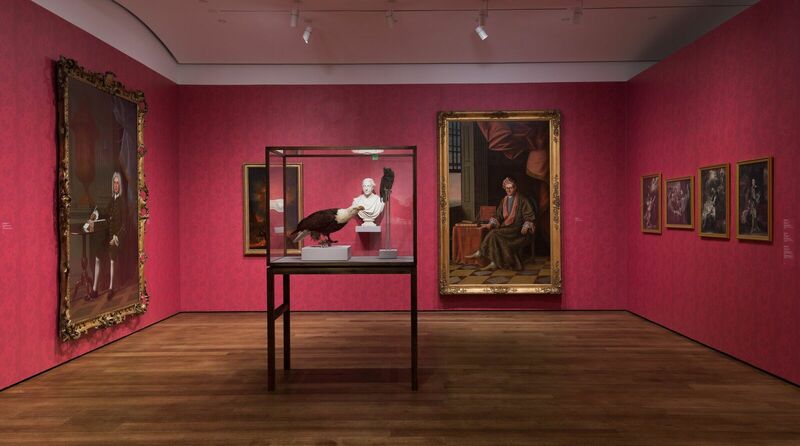 Included are full-length portraits by John Singleton Copley; exceptional examples of Native Hawaiian feather work and carving by indigenous artists of the Northwest Coast; a dazzling, large-scale orrery (a model of the solar system) by Joseph Pope; mezzotints after the work of expatriate American artists; and Stephen Sewall’s mural-sized copy of the Wampanoag inscription on the landmark known as Dighton Rock, an 11-foot boulder located in Berkley, Massachusetts. The objects are drawn from a number of private, academic, and public collections in the United States and the United Kingdom, including from the following collections at Harvard University: the Collection of Historical Scientific Instruments, Harvard Art Museums, the Harvard Map Collection, Harvard University Archives, Houghton Library, the Mineralogical and Geological Museum, the Museum of Comparative Zoology, the Peabody Museum of Archaeology & Ethnology, and the Warren Anatomical Museum. An illustrated catalogue with essays by a mix of curators, professors, conservators, conservation scientists, and doctoral candidates has been published in conjunction with the exhibition. The publication advances new understandings of early American art history, and serves as a rich resource for any reader interested in the art and culture of the Atlantic World. Organized by the Harvard Art Museums. Curated by Ethan W. Lasser, the Theodore E. Stebbins Jr. Curator of American Art and Head of the Division of European and American Art at the Harvard Art Museums. The Philosophy Chamber: Art and Science in Harvard’s Teaching Cabinet, 1766–1820 will travel to The Hunterian, at the University of Glasgow, Scotland, where it will be on view April 17 to July 15, 2018. Explore the Philosophy Chamber through our online Digital Tool featuring an audio podcast, additional information about the works on display, reactions from visitors to the chamber during its active years, and excerpts from the faculty lectures and student debates that once enlivened the room. Learn more about the exhibition in our series of short videos, available on YouTube. DJ /rupture (a.k.a. Jace Clayton, Harvard ’97) created a Spotify playlist that sonically explores themes found in the Philosophy Chamber exhibition. Information about events related to the exhibition, including lectures, a symposium, gallery talks, and Materials Lab Workshops, can be found in our calendar. March 20, 2017 Significant gifts and grants recently received from major foundations, institutions, and an individual donor will provide breakthrough support for teaching and learning initiatives and exhibitions in the coming years. August 31, 2016 As we prepare for our 2017 exhibition on Harvard’s 18th-century Philosophy Chamber, a team of conservators and curators from the Harvard Art Museums and the Peabody Museum of Archaeology and Ethnology are closely studying a 1768 copy of inscriptions from Massachusetts’s Dighton Rock. January 13, 2016 Scholars are going straight to the source to develop an exhibition about Harvard’s 18th-century Philosophy Chamber. September 4, 2015 Curators and other experts are conducting research for a future exhibition about Harvard’s 18th-century Philosophy Chamber. October 31, 2017 A unique wallpaper-covered room in our Philosophy Chamber exhibition gives visitors a sense of how the original space might have looked. Explore the Philosophy Chamber exhibition through this digital tool featuring an audio podcast, additional information about the works on display, reactions from visitors to the chamber during its active years, and excerpts from the faculty lectures and student debates that once enlivened the room.